Book now transfers from Mykonos airport. Holidays in Mykonos among the most Greek islands, Mykonos island is located almost in the centre of the Cyclades complex. It is particularly famous for the cosmopolitan atmosphere, the exciting nightlife, the picturesque Cycladic architecture and the magnificent beaches that makes holidays in Mykonos a magnificent experience. 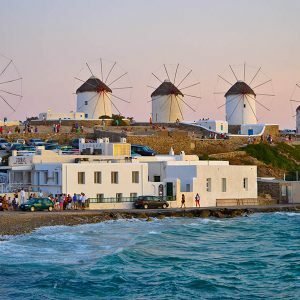 There are many things to do in Mykonos Greece, an island perfect for people of all ages: walk along the narrow streets of Chora, see the sunset from Little Venice, stay in luxurious hotels and swim in exotic beaches. Super Paradise, Paradise and Kalo Livadi are fabulous places to swim and spend a day under the hot sun. In the evenings, head to Mykonos Town and enjoy a night out in the many bars and clubs. Mykonos island is one of the top destinations in Greece, this island is famous for the vivid nightlife and the gorgeous beaches. 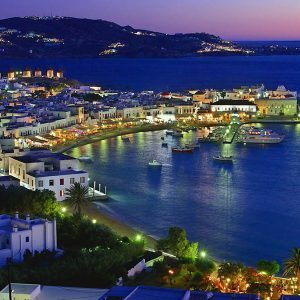 Geographically located on the northern side of the Cyclades, almost in the centre of the Aegean Sea, Mykonos is the ultimate holiday place for all ages and preferences, especially for youth looking for all day and night entertainment. Many private yachts and cruises also arrive in Mykonos Greece almost daily in summer, creating a cosmopolitan atmosphere. Things not to miss on the island are the fantastic beaches on the south, the sunset from Little Venice, the view from the windmills and a night out in Mykonos Town. Mykonos holidays are often combined with holidays to Santorini and other Cycladic islands. Ano Mera. More limousine, taxi transfers see below. – upon arrival at Mykonos airport (JMK) please look for your driver, who will hold a personal waiting sign with your name on it.